Downtown convenience in quiet neighborhood for restful stay! 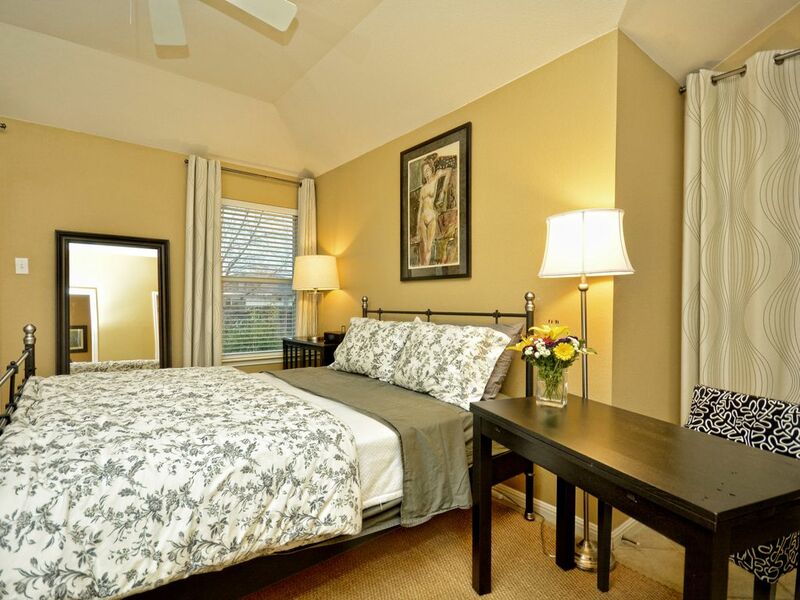 Our spacious, quiet, one bedroom studio is a comfortable home base for tourists and business travelers. We look forward to hosting you in our convenient Austin neighborhood three miles south of downtown. We are 1/2 mile from newly developed The Yard—a collection of breweries, coffee shops, wine tasting rooms, food trailers, and a whiskey still. Walk down and have everything you need in one spot! The Spokesman has excellent coffee and a light breakfast/lunch menu. St Elmo brewery has been rated one of the top new breweries in town, has a tasty food truck Sour Sop, and offers great music including a Thursday night bluegrass set. A plush queen-size bed and quiet neighborhood make for a wonderful night’s sleep. Our walk-in closet has plenty of storage room and includes a mini-fridge, Keurig coffee maker, and a microwave for your convenience. Coffee and tea are complimentary. Enjoy a cup of coffee in the morning or glass of wine in the evening on your private patio. We are located 15 minutes (about a $15 rideshare) from the airport. Most of our guests have a car for transportation, but Uber, Lyft, Fasten, Rideaustin all operate here and are reasonably priced rides from the studio to downtown. The studio is well-stocked with all the basics: linens, some extra toiletries, a hair dryer, coffee/tea set up, bottled water. We are frequent travelers ourselves and want to make your stay is as comfortable as possible. Carey and Dave are well traveled and both work at a large hospital in downtown Austin. Carey is from Texas and has been in Austin since 1988, Dave is from Montana and relocated to Austin to be with Carey (and enjoy mountain biking year round!). If you would like any recommendations for outdoor activities, cycling trails, parks, etc they can help out. We chose this property when the house was built because we both love cycling and wanted to be able to ride our bikes to downtown and work--20 minute leisurely ride to Town Lake, 10-15 minutes to S. Congress restaurants, Continental Club, great coffee shops and Mexican food. The neighborhood continues to develop and we now have some great breweries, coffee shops, and music venues within walking distance at The Yard. We love the location of this home and the low upkeep. Tile floors throughout keep things clean and vaulted ceilings make the area feel larger. The studio gets plenty of light, but has 2' wooden blinds and curtains if you would like to sleep late! 3.3 miles, 8 minutes straight down S. Congress to Town Lake Trail, downtown, Continental Club, and all the restaurants and entertainment of S. Congress and downtown! The studio has everything you need for your trip to Austin. It was very clean and comfortable with convenient access to downtown and all the best eateries on the south end of Austin. Carye was a fantastic host with complimentary waters and coffee. Will stay again! Very nice little place. Neighborhood was very quiet, and owners were also quiet. Close to downtown and everything you need. Definitely would recommend! We are so glad you liked our neighborhood and our studio. Hope to see you again, Harlie! Quiet, Clean, and Private—Close to Austin! Very prívate. Very clean. Loved the location in quiet neighborhood but just a 10 min drive to downtown Austin. Nice to have the Keurig, refrigerator and MW. We’d stay again for sure. We are so glad that you and your wife enjoyed your stay at the studio! Especially since you had to spend so much time inside during that unusually cold and rainy weekend. Hope you come back to Austin during one of our 300+ sunny days of the year! nice place in a nice neighborhood close to the highway. Thank you, Ivan! Glad you liked the studio and its location. Hope to see you back again soon. drive down scenic S. Congress 3.5 miles to Town Lake and downtown, passing numerous restaurants and music venues along the way. The neighborhood is only six years old and conveniently located to grocery stores, a liquor store, the famous Hill's Cafe is only 1/2 mile down the road! Check in time is 4:00pm, check out is 11:00 am. Non-smoking property. No pets.